The Great War. Not great because it was good--great for the sheer size of the battles, great for the introduction of chemical weapons and flamethrowers, great for the number of lives lost, great for the devastating impression it left on people. Between 1914 and 1918, 9.5 million people died in battle and another 21 million were injured or maimed. These numbers don’t take into account the thousands of children that died of malnutrition, hundreds of thousands of battlefield horses and numerous other collateral losses of life. It was a war that left deeper emotional wounds than anything else, leaving people to hope never to experience another war; ‘la ders des ders’ the French said, the ‘last of the last’ for human bloodshed. At 11 am on 11th November 1918, the Armistice treaty was signed, ending the warfare between the Allies and Germany. Across France, bells chimed at churches, playing ‘cessez le feu’ to announce the cease-fire and the Marseillaise was played in town squares. It was a relief and cause to celebrate, but after so many years of war, nearly every nation was brought to its knees. Across Europe, fields in the countryside had become scenes of treacherous death and mass burial grounds. People were starving and governments were broke. There wasn’t much left to celebrate other than peace itself. promising never to forget--many young people don’t fully understand the gravity of the war and the scars that it left on the survivors. Perhaps if not for Britain’s strict adherence to wearing poppies for remembrance, even more people would forget. Time has done its work to mend the battlefields and the physical damage to the land. Trenches that were once muddy scenes of death are now covered with plants and flowers. But just because these horrific scenes have disappeared, he emphasises that we must never forget. This Sunday, 11th November marks the 100th anniversary the Armistice. Ceremonies, exhibitions, and parades have been planned across the country, including a large celebration and parade in Paris with multiple heads of state. Here on the Riviera, many celebrations are planned with some exceptional events in Grasse, Nice, and Beausoleil. For events in your town, check the website of your local Marie. Some very special events are planned for the weekend, including a full-costume re-enactment on the Quai des États-Unis. Soldiers, nurses and original vehicles will be on display. See the photos for details. On Saturday, 10 November from 8:30 to 11:40 am, wreathing lying ceremonies will be performed at churches and plaques across the city, including Parc Pheonix and Place Blanqui (Gare Riquier). At the end of the day, from 5:30 to 9:30 pm there will be an homage to the fallen Niçois at the Monument aux Morts Rauba Capeu where residents are welcome to place flowers. On Sunday, 11th November from 8:30 am to 5:30 pm, there will be a full-costume display on the Promenade at the Quai des Étas-Unis near the Opéra. At 10:55 am, the Nice cathedral, Sainte Reparate will play ‘cessez le feu’, followed by the ringing of the ancient bells and then mass. At 2 pm, a full-costume procession will leave Gare Thierry and follow Avenue Jean Médecin to the Hôtel de Ville for the inauguration of a new plaque honouring the occasion. At 3 pm, the official Armistice ceremony will take place at the Monument aux Morts Rauba Capeu. In preparation for the centenary, the Rauba Capeu monument was opened to discover a copper urn with over 2,000 soldiers’ tags. These tags were deposited by family members when the monument was inaugurated at the ten year anniversary (90 years ago) and have not been seen since. The contents will be on display in an exhibition at the Hôtel de Ville on Friday and Saturday. Saturday, November 10 at 11 am at the Albert Camus Media Library features "Roadmap of a soldier musician 1914-1919" by the Hidraïssa Company of Vallauris (Tel. : 04 92 19 75 80). 10:40 Port Vauban - Stele of the Mariners perished at sea with a laying of wreaths by patriotic associations and the City of Antibes Juan-les-Pins and a salute to the Jean Moulin monument. 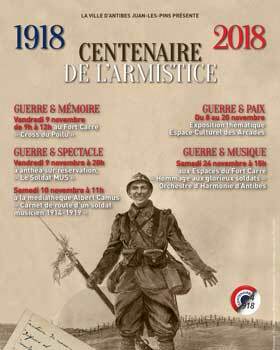 War & Music concert on Saturday, November 24th at 3 pm at the Espaces du Fort Carré, playing "Tribute to the glorious soldiers" by the Orchestre d'Harmonie d'Antibes under the direction of Daniel Jeangeorges (free admission). Ceremony with a performance by Borne Voix Sacrée and wreath laying. Statement by Dr. Guy Lemaire, speech by David Lisnard, Mayor of Cannes, President of the Cannes Lérins conurbation and Vice-President of the Alpes-Maritimes Department. Reading of the message from the President of the Republic by André Frizzi, Municipal Councillor Delegate for Veterans Affairs. Speech by mayor David Lisnard. Laying of wreaths and patriotic songs performed by the orchestra classes of the Cannes Conservatory, the orchestras of the Jean Macé and Eugène Vial de Cannes schools, the Espérance de Cannes and the Académie Provençale. Until Sunday, 11th November - Espace Miramar - Life in the trenches, between the lines 14/18. Joint exhibition of period objects and archives on the First World War. From Saturday 10th November to Monday 19th November - Moulin Forville - Victor Tuby in the Great War (Costumes of the Poilus). See the intimate collection at the Villa Saint-Hilaire in Grasse. On Saturday, 10th November a talk on ‘La Guerre et la Société’ (War and society) will take place at the Bibliothèque & Médiathèques de Grasse from 11 am to 12 pm. Free entry. The commemorative centenary ceremony will take place on Sunday, 11th November at the Marie de Grasse. At 10 am there will be High Mass Solenelle at the Notre Dame du Puy Cathedral. At 11 am, there will be a ceremony at the Monument aux Morts in Place du Petit Puy with a wreath laying. On Saturday 10th November at 11 am will be the inauguration of the exhibition ‘Life in the Trenches’ at the Chapiteau Place de la Libération. Sunday 11th November at 3:45 pm a full-costume historic procession will walk through town from the Moneghetti gymnasium to Place de la Libération. At 5 pm there will be the relighting of the flame of the Unknown Soldier, followed by a speech from Beausoleil’s mayor, Gérard Spinelli, and a wreath laying at the Monument aux Morts. Wreath laying at 11 am at the Monument aux Morts with Mr Franck Vinesse, Deputy Prefect of Nice. Wreath laying at 10:40 am at the Monument aux Morts, Place des Victoires with Ms Gwenaëlle Chapuis, the Deputy Prefect of Nice-Montagne. At 11 am a gathering at the Place des Patriotes, then a ceremony at the Monument aux Morts, followed by a toast in the square. Wreath laying at 11 am with Mr. Jean-Gabriel Delacroy, Cabinet Director of the Nice Prefecture. General Secretary of Nice prefecture, Ms Françoise Taheri will lead the ceremonies starting at 12 pm. At 10 am, a ceremony at the Memorial With Mr Jean-Luc Videlaine, Prefect of the Var, Place Gabriel Peri. A display of the troops, presentation of decorations and laying of wreaths.